Via Americablog, I see that Bush celebrated September 11 with a little flag desecration (a habit I’ve mentioned before). It still seems to me that if something is bad enough to require a constitutional amendment, it should be an impeachable offense. 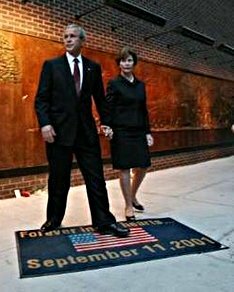 Of course, the real question is whose idea it was to make a September 11 flag doormat in the first place. That sort of thing hasn’t gone over well with Republicans in the past.